If you are looking for a stylish small car, check out the Toyota Yaris at Capitol Toyota. 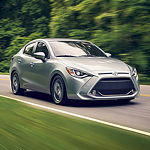 This fuel-efficient vehicle is designed with both safety and style in mind. Like all Toyota vehicles, the Yaris has a proven track-record of great reliability. The Toyota Yaris is equipped with LED headlights that have an automatic on and off feature. LED headlights are stylish, and they provide superior visibility when driving in foggy and misty conditions. The on and off feature turns the lights on automatically in low-light conditions, and the lights turn off automatically when you turn off the Yaris. The Yaris also comes with power mirrors that are heated. With heated mirrors, your view won't be obstructed by mist or ice. The power feature allows for easy adjustment for any driver. The mirrors also have integrated LED turn signals that display your intentions clearly to other drivers on the road.